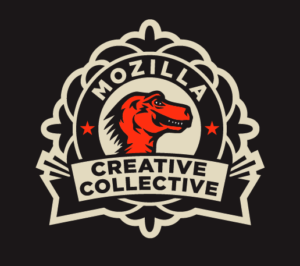 The Mozilla Creative Collective is a newish project designed to organize and grow our budding visual design community. When the site launches later this year it should be a pretty awesome place for designers to share their work, make new connections and help spread the word about Firefox, Thunderbird and the other Mozilla products. Of course, any visual design community needs a cool logo, which is why we asked Studio Number One to help us out. And, any open visual design community needs to get people as involved as possible in processes like these, so I’ve been posting each round of the comps for everyone’s feedback. After all that, we finally have the *official* Creative Collective logo (see below). I’m really happy with how it turned out…big thanks to Studio Number One for their work, of course, but we also owe a huge debt of gratitude to the dozens of people who offered their comments (both good and bad) along the way. This is a great example of what an open process can achieve…your input had a tremendous impact on the final look of the logo. Thank you! So, what’s next for the Creative Collective? * Main thing right now is to nail down the full scope and functionality of the site. We’re putting the final touches on the wireframes with Airbag right now, and Tara will be sharing some details soon on some of the features we’ll be including to make participating in the Creative Collective as fun as possible. * After wireframes, we’ll move on to the design…will be interesting to see how the logo ends up influencing that. * Then, Ryan Doherty and our amazing WebDev team will have to build the site…no small task, but they’re more than up to it. * If you want to follow along (and contribute along the way), then sign up for our email list or follow us on Twitter. Otherwise, just get ready to flex those creative muscles!